- Benito is shocked to see that Annalise is Lou's new girlfriend. - Brad reckons he can cope with swimming for help. Doug tells Brad that sharks are like lightning - they never strike in the same place twice. Brad says that they have something else in common - they both happen too fast for you to do anything about it! With that, Brad dives into the sea and starts his swim for shore. Pam watches disapprovingly as Annalise kisses Lou on the cheek before going to the toilet. She mutters to Gaby that the Waterhole has become quite a pick up joint(!) She refuses another drink and turns to Lou as she leaves. PAM: Getting on quite well with your friend, Lou. LOU: Oh, you mean my new housemate? How lucky can a bloke get, huh?! PAM: Er, pretty lucky I hear. You and Doug. Luckiest blokes alive when it comes to picking up women. PAM: Don't play dumb, Lou. You were here with Doug the other night. LOU: I was? We were? PAM: Stop covering for him. You were seen. Doug was carrying on with...*some* woman. LOU: (dawns on him) Oh, Sue-Ellen! Oh, honey, Doug wasn't carrying on - he was trying to fend her off. LOU: Yeah, yeah, I've never seen a woman come on so strong. She wouldn't take no for an answer but Doug couldn't have cared less. PAM: Don't take me for a fool, Lou. LOU: PAM, nothing happened. I think she had one pink gin too many, got a bit amorous, you know? LOU: Honestly, you could've dropped Doug in the middle of a harem and he wouldn't have taken any notice. I think he was brooding about you. LOU: Hey, Pammy, it's the truth. I swear it on a stack of Bibles. Nothing happened. Cathy is pleased that the Robinson-Martin/Alessi feud has ended. Helen agrees, especially as she believes that she caused it. Cathy says that Benito can be stubborn. Jim thinks that it's all best forgotten and is just glad that he can take Benito for a drink without being a traitor to his own family. Cathy thinks that Benito would like that. Jim asks Cathy if Benito plays golf - and apparently he loves it. Jim thinks that they should organise a round. Cathy leaves and Helen thinks that it's a nice gesture. Jim says it isn't a gesture - he just wants someone to play with! Helen says that it's good NR (neighbourhood relations!) regardless and suggests that Jim should show the same generosity towards Doug and Pam. JIM: (annoyed) Let's not get into that. You've already made your position perfectly clear. HELEN: At least you've made a point of getting them to talk but there's more you could do. JIM: I'd rather just stay out of it. Whatever happens is their business. HELEN: I still can't believe that you, you'd want that family to break up. Not deep down, anyway. Talk to them again. Tell Doug that you have no designs on Pam. It's what your conscience is telling you to do. HELEN: Jim, you know as well as I do that most couples go through rough times but it doesn't mean that they shouldn't be together. The question is - are you on their side, or not? There's a long pause. Jim looks uncomfortable. 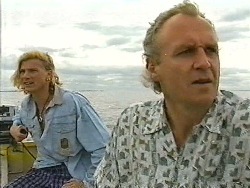 HELEN: Doug and Brad have gone fishing. They should be back soon. You could go and meet them. Take Doug for a drink at the fishing club. Brad is swimming. The boat is nowhere to be seen. Jim is on the shore and walks from the boat hire hut across the sand. Brad stops swimming and stands up in the edge of the water. Jim is surprised. He rushes over to Brad. Brad seems quite pumped. BRAD: I don't believe it! I made it! Jim is confused, and Brad explains that Doug's still out in the boat. 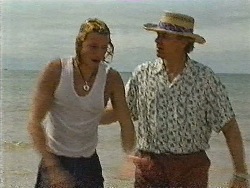 Brad is keen for them to get a move on, as the current was taking Doug straight out to sea. They stride up the beach. Lou is finishing up a sale. Benito comes over, ribbing him about finally putting in an appearance. Lou tells him not to have sour grapes just because he closed a deal in six and a half minutes! Lou tells him that he's taken $1500 deposit, and the bloke will be back with $12000 tomorrow to clear the balance. Benito is clearly slighted by Lou's insinuation that he can't sell, so makes a jibe about how he's the one looking after the books and the yard. Lou tells him to chill out - as he told him when he first arrived, sales are what matter, as they make the business tick over. Benito gets offended when Lou suggests that he's rather set in his ways! BENITO: What's got into you lately? LOU: LIFE! LIFE'S got into me! You've got to think young, or get left behind, mate. Marking time and wondering when your number's coming up. Me? I intend to go out with a BANG! What about you? LOU: Ooh, lock up for me, will you? I'm off to the hairdresser. Lou dumps the keys on Benito. Benito silently fumes. Brad and Jim are out in a boat looking for Doug. Jim thinks that he could've drifted anywhere by now. Brad wants to do another circle, but Jim points out that they've done from the sea to the shore 3 times already. 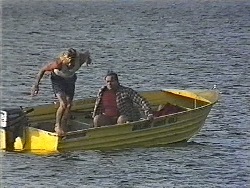 Brad worries that the boat could've capsized, especially as Doug's merely an ordinary swimmer. Jim thinks that he'll be fine, as he'd have the sense to hang onto the boat and there were lifejackets available. They agree to turn back and let the coastguard know what's happened. Pam is furiously using a sewing machine, whilst Gaby is working on some dress designs. Pam is angry with herself for not believing Doug and jumping to conclusions. Pam is very keen on the idea of Doug staying at home for dinner after he's been fishing, but she's worried his pride might stop him. She decides to make a yummy dessert to entice him, and excitedly rushes off to make a chocolate pudding! Gaby laughs at Pam's enthusiasm. Gaby is designing Phoebe's wedding dress, which is the third she's made of late, if you include Madge's two efforts. Gaby sighs that none of them have made it to the altar yet - she could get paranoid about it! PAM: At least Phoebe didn't insist on designing it herself! There's a knock at the door. Pam is giddy. PAM: Ooo, there they are! Wet and hungry and ...hopefully longing for a bit of TLC! Pam flings the door open to reveal Jim. He tells her it's about Doug, and Pam explains that he's gone fishing. Jim says that he knows - he went looking for him. JIM: Pam, Doug's in the boat somewhere. He's been missing for the last couple of hours. PAM: (confused) He's with Brad. 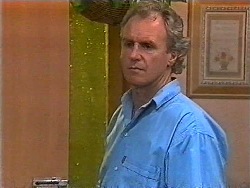 GABY: Well, they were together, weren't they? JIM: Brad swam for shore when the motor failed. We both went looking for him straight away. And then we called in the search and rescue people. PAM: Well, where's Brad now?! JIM: He's still there. He'll call us if there's any news. GABY: I don't believe this. PAM: *If* there's any news?! Well, they'll find Doug, won't they?! JIM: They're doing everything possible. Even with flares and spotlights, it's very dark out there. Pam and Gaby worriedly clutch each other. Annalise is preparing some food. Lou arrives home - wearing sunglasses and with dyed hair! LOU: Before you tell me how devastatingly handsome I look, I have a little surprise for you! He hands her a jewellery box - they're earrings. Annalise is chuffed and kisses him. She's surprised that he's dyed his hair - she liked it grey because she thinks that it's distinguished and is a sign of success. Annalise points out that she's practically a fully qualified hairdresser now, and offers to have a go. Lou isn't keen because he wants to relax. Annalise offers all sorts of treatments, which Lou refuses but when she starts to massage his shoulders, he relents! Jim is on the phone - they've postponed the search until morning as it's too dark. Pam is upset and thinks they should get extra boats or lights! She's been upset by a news report on the television. Helen tells Pam to rest as she obviously won't get any further news tonight. PAM: (tearfully) How could this happen? To Doug of all people. Helen looks upset at Pam's reaction. 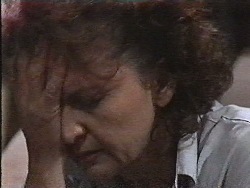 Gaby offers to run Pam a bath and when she declines, Gaby decides to take on herself - she needs to do something. Pam cries about the argument she had with Doug. PAM: (wailing) I told him I never wanted to see him again. Jim hugs her as she sobs. Annalise is putting protein conditioning moose on Lou's hair, which has turned it temporarily blue! He seems quite unsure about it all, but Annalise reels off some sales patter. LOU: (laughing) You sound like a TV commercial. BENITO: Oh, Lou. Caught you at a bad time, have I? LOU: Not at all, Benito. Any time, you know that. BENITO: Nice hat(!) Is this the latest disco fashion? LOU: Ha ha ha, you're a real card, aren't you? BENITO: Joining the blue rinse set, are we? Benito proceeds to laugh loudly. LOU: (annoyed) Not at all; this is a blue moose! BENITO: Moose?! 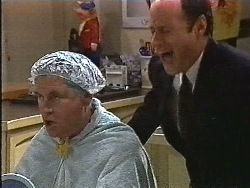 I thought you were supposed to eat that, not spread it on your bald patch! Benito carries on laughing loudly! LOU: *I* don't have a bald patch! And if you're thinking of starting a new career as a stand up comedian, I'm afraid your family is going to starve! Now what do you want?! Benito finally stops laughing long enough to offer Lou some time off work. He reckons that things are quiet at the car yard, so he can manage by himself. LOU: Oh, thank you, that's very kind of you. Want to hog all of the best customers for yourself, do you? Well, go ahead. *You* need the practice! Annalise reads out an advert she's seen in the paper for a new disco which has some cocktail offers on. She wants to go and is surprised that Lou doesn't - she thought he was a rager. LOU: Well, I thought this stuff had to stay on for an hour? ANNALISE: So? It'll take me that long to get ready. LOU: But it's 9 o'clock now, love! ANNALISE: (rolling her eyes) It doesn't start happening until 11! Lou isn't keen, saying that he's just started to unwind. Annalise tells him to wind up again! Benito chips in, teasing Lou that it shouldn't be hard for a rager like him(!) Annalise waltzes off to get ready. 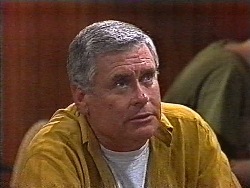 LOU: As you can see, Annalise finds me...*very attractive*! BENITO: Yeah, attracted to your money and your car. LOU: Not at all, it's my vibrant personality! BENITO: She's looking for a sugar daddy, Lou and you're the perfect age. LOU: You don't know what you're talking about. BENITO: And with the new blue hair...oh! Benito mockingly makes the perfection sign with his hand. He leaves and Lou peers at himself in the mirror! Pam is lying on the sofa in the darkened living room. Gaby opens the curtain slightly, to reveal that dawn has broken. 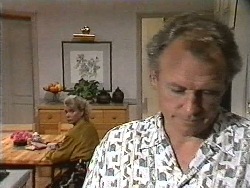 She wakes Pam, which shocks her and she asks after Doug but there's been no news. Apparently it's 5am. Pam says that she was dreaming about the cruise they went on for their second honeymoon when the kids were little. Gaby laughs and remembers that Doug got sunburnt. PAM: Oh, some honeymoon(!) I couldn't even touch him. He spent the whole time in the cabin covered in ointment! Gaby laughs and Pam cries. They hug tightly. PAM: Years ago, we went to a party. There was a woman there reading fortunes, tarot cards or something. Anyway, your father and I got roped in - you know how people insist. So she dealt the cards for me, it was the usual guff about trips overseas and tall dark strangers. But she wouldn't do it for your father. She wouldn't say why. Maybe she knew. GABY: Come on, Mum. You've never believed in this sort of thing. PAM: (crying) I never believed I'd lose him like this either. I've always stood by him in the past. Supported him. And now I might not even get a chance to apologise. They both break down in tears. PAM: Or to tell him how much I love him. Benito has made a sale and he's extremely enthusiastic. Cathy comes over - Benito had left his briefcase at home. Benito is absolutely over the moon as he made a £3000 sale in the first half an hour of trading. He shows her the cash. Cathy is surprised that the man paid in cash, as people don't usually carry money around like that. Benito thinks that people like themselves carry money around like that - nice, successful people! He grabs Cathy and spins her around. Brad returns home. There's no news of Doug or the boat. He apologises. Pam hugs him tightly. Annalise is raving about their great night at the disco and wished she had a video camera. Lou, meanwhile, has fallen asleep at the breakfast table! Annalise laughs about a dance move they did called the hitchhiker and suggests that Lou teach her all of the old-fashioned moves, like the twist or the Charleston! LOU: Steady on, I'm not that old! Lou talks about the men at the club, and how they had tight jeans and rippling muscles. He wonders if that's what girls go for, but Annalise thinks they're over the top - just dumb show ponies. Lou comments on her own attractiveness, clearly worried - but she embraces him and says that she thinks men get more interesting as they get older. When she goes to make him a coffee, he smiles to himself. Helen is doing some gardening. Jim comes out and says that there's no news. 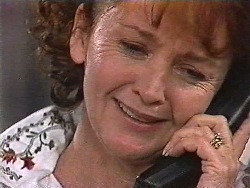 Helen is upset on Pam's behalf. JIM: I'm going to see if I can help. HELEN: (warningly) Jim. She'll need time alone with her family. JIM: She needs support. And I'm going to see she gets it. 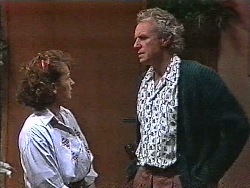 HELEN: You're still in love with her, aren't you? Jim looks at the floor. HELEN: Don't you think she has enough on her plate with Doug missing? JIM: I tried, Helen. I'm sorry. Jim walks over to Number 28. Helen looks disappointed. Benito comes over to brag about his sale at the car yard. He laughs at Lou thinking they'd never unload the Volvo and drops the $3000 on the table. Lou's eyes widen. LOU: Oooh, la la! You can't scoff at cash. BENITO: The guy was rapt. Reckoned it was a real bargain. Lou opens a note and his face falls. LOU: So he should be. He must be laughing. LOU: You've been had, mate. These notes are *fake*. 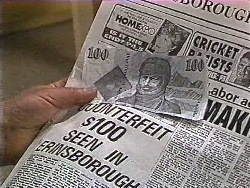 Lou shows Benito a newspaper article about fake banknotes being circulated. Benito is dumbstruck. BENITO: (quietly) It's not possible. LOU: Look at the serial number. It's not only possible, mate - it's happened! Lou points out that they have to report it and thinks it's a crying shame to lose $3000. LOU: *Someone's* going to have to make a lot of car sales to make that up. Annalise and Lou both stare at Benito. Benito looks gutted. Pam is telling Brad to change his clothes and have something to eat before he goes back to search because she doesn't want him collapsing. Brad thinks he hasn't got time, but Jim and Gaby force him to. Gaby says that she'll make sandwiches for them to eat on the way. 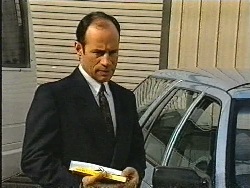 Jim offers to stay back and keep Pam company whilst they search. The phone goes and Brad dives for it. 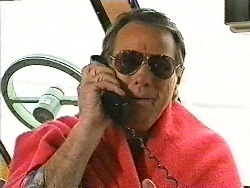 The caller wants to speak to Pam, so he passes it over. Pam looks worriedly at Jim. As the call goes on, we cut between Number 28 and the rescue boat. RESCUE OFFICER: It's search and rescue. PAM: Have you got some news? RESCUE OFFICER: Hold the line one moment, please. PAM: Ohhh, it's bad news, I know it. Brad and Gaby rush to her side. On the boat, Doug takes the phone. PAM: Doug?! Is that you?! DOUG: Yes, it's me, love. Pam goes weak with relief. Brad and Gaby are over the moon. Pam tells him that they've been worried sick as they thought they'd lost him. Doug says that he was worried himself! He asks after Brad. In the background, Jim silently makes his way to the door. He looks back at the family huddled together. Doug explains that he was lucky as he drifted down the coast and a trawler picked him up at 4am. Pam is very relieved that Doug's ok.
PAM: ...oh, I love you.